Pipedrive is a CRM platform designed to help your business drive more sales. Everything from pipeline management to sales forecasting and from activities/goals tracking to sales reporting is designed with a single purpose: to help you to take action, remain organized and stay in control of the complex sales process. Our founding philosophy has always been a simple one: that better conversations with customers will always lead to more revenue. And because better conversations mean happier customers. When customer service is able to pinpoint sales opportunities or identify existing opportunities in a sales pipeline, each individual agent becomes be more empowered to drive additional revenue for the company's bottom line. 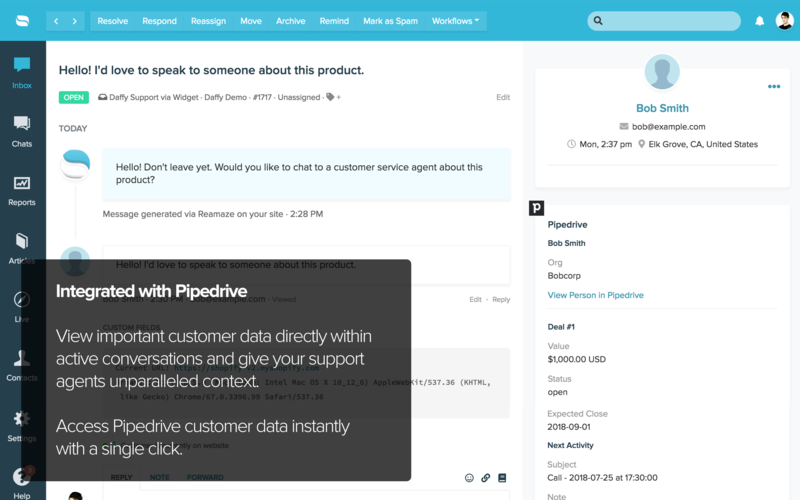 Instead of just answering customer questions and seeing customer service as a cost center, integrations like Pipedrive allow your customer service team to become a revenue center. What's next for the integration? The next iteration of the Re:amaze <> Pipedrive integration will support the ability to create new leads, new opportunities, and new deals through Re:amaze conversations. We're actively taking feedback from those that use the integration. To submit your feedback, simple message support@reamaze.com or message us in real time through your Re:amaze dashboard! Enter your account details to link your existing account to Pipedrive You can also initiate the install process from within your existing Re:amaze account from under Settings > Apps > Pipedrive.